ModuTile interlocking floor tiles have a diamond top surface pattern. The modular trade show tiles make a great portable floor for a convention booth or product display. They are available in a variety of colors, and the different colors can be attached together to create colorful patterns and designs. Furthermore, if you are interested in having a logo printed on the portable tiles, we can create custom tiles for you. Why are the ModuTile Diamond Top Trade Show Tiles Perfect for Event Flooring? The diamond top surface makes them slip resistant. Can be used as modular basement or garage flooring. 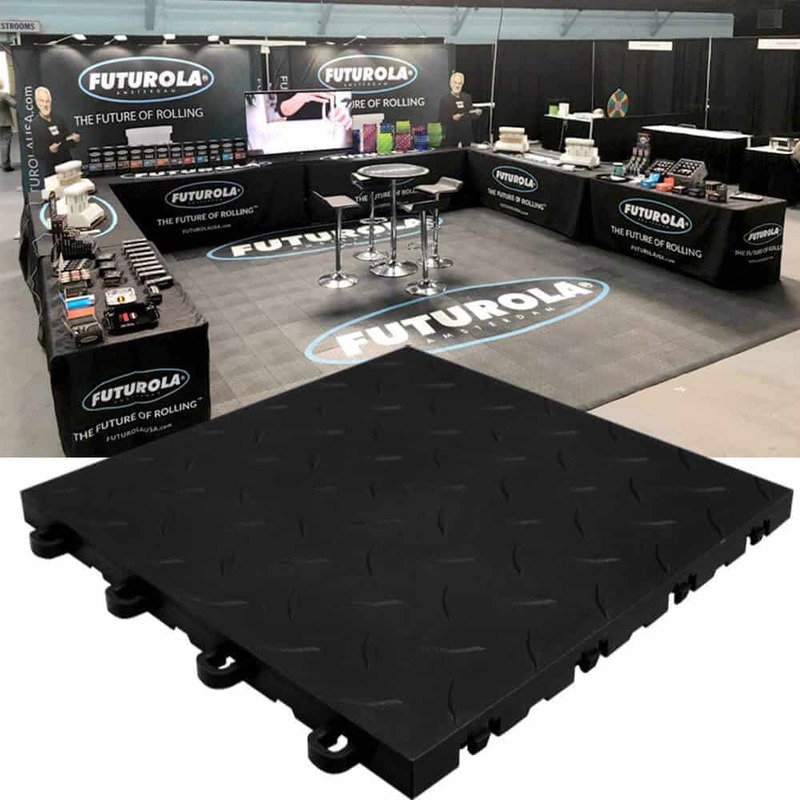 ModuTile proudly offers custom floor graphics on our diamond top interlocking trade show tiles to take your product display to the next level. We can customize the modular tiles with your logo or special message to really give you an aesthetic edge over any competitors. Adding graphics to your trade show floor tiles will greatly enhance visual recognition of your business and capture your customers’ attention. The Diamond Top surface pattern looks great, but it also is designed for safety when walking on the trade show tiles. 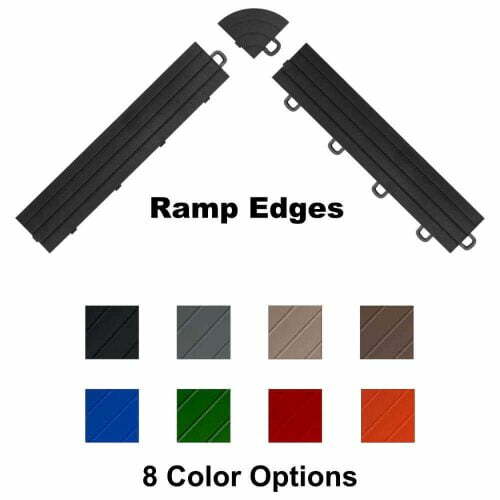 The raised pattern can prevent slipping and is appropriate for use in product displays. For ease of assembly, the 4 loop-to-peg interlocking system snaps together without the need for tools. Two sides of the tiles have loops and the other two sides have pegs. They interlock like puzzle pieces to form any size event floor. Similarly, the tiles may easily be disconnected and removed when it is time to leave. Our specially formulated high-impact polymer is rigid (hard). When the floor tiles are interlocked together to form a floor, the result is a strong solid surface that will support the weight of heavy objects. Unfortunately, the structure of the tiles cannot accommodate wires or cords running under the tiles. You would have to lay the cords or wires over the tiles and tape them down to the top of the tiles to prevent a tripping hazard if needed. We offer multiple colors of Diamond Top event floor tiles, all made in the USA. Different color combinations of the can be used together to create various patterns such as borders or checkerboard designs for your trade show floor or product display. In addition to trade show flooring, our diamond top interlocking floor tiles are ideal for residential garages and basements. 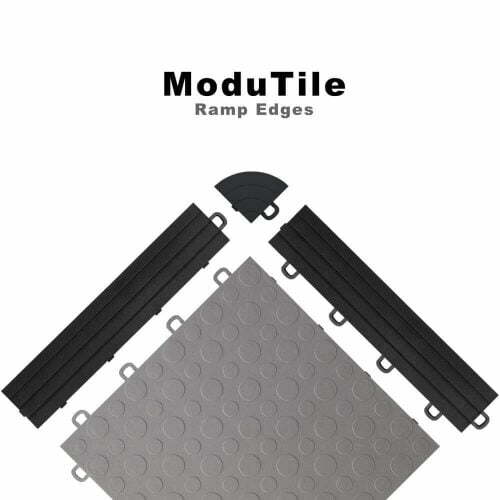 Follow the link to find out why ModuTile Interlocking Garage Floor Tiles are an ideal solution for your garage floor. As always, if you have any questions please feel free to call us at 713-663-6060 message us via our Contact Us page. Thank you for the great logo work.